OPPO Clavicle Brace is a non-stretch product providing maximum stability for the user. May be utilised as an aid for the stabilisation and reduction of clavicle fractures. Generous felt padding provides proper immobilisation and enhances patient comfort. Adjustable hook and pile closure facilitates proper fit. Foam axillary pads covered with tubular jersey knit. Available in five sizes - measurements below. X-Small 460 - 537mm 18.125 - 21.125"
Small 540 - 638mm 21.25 - 25.125"
Medium 641 - 765mm 24.25 - 30.125"
Large 768 - 892mm 30.25 - 35.125"
X-Large 895 - 1045mm 35.25 - 41.125"
Open the pile straps and thread through the buckles, then put on the brace. Hold the ends of straps using both hand, one on each hand. Pull ends out to the side until brace is tight and shoulders are drawn into correct posture. 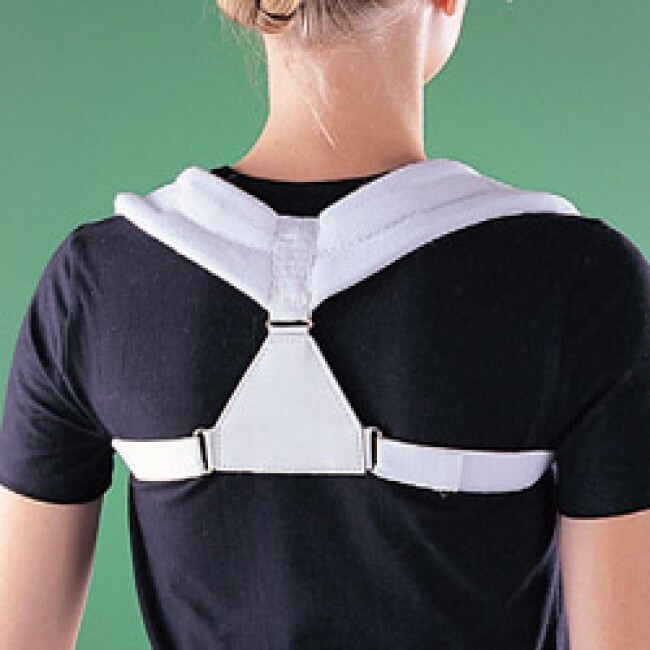 Bring the straps under the arms and attach to the front of the brace. Wash in cold water and hang dry. Do not bleach. Do not iron. Do not dry clean.